Patricia Sardeson speaks . . . . It occurred to me as we went walking in downtown Tlaxcala that much of what we see is like it was when I was a child and went downtown in our small Wisconsin city so many years ago. It was the thing to do on a Saturday morning, to go downtown, get a coke and French fries, see friends, and possibly a movie as well. As were were walking we noticed the vast amounts of large shoe stores. Many were next door to each other creating much competition for each other. 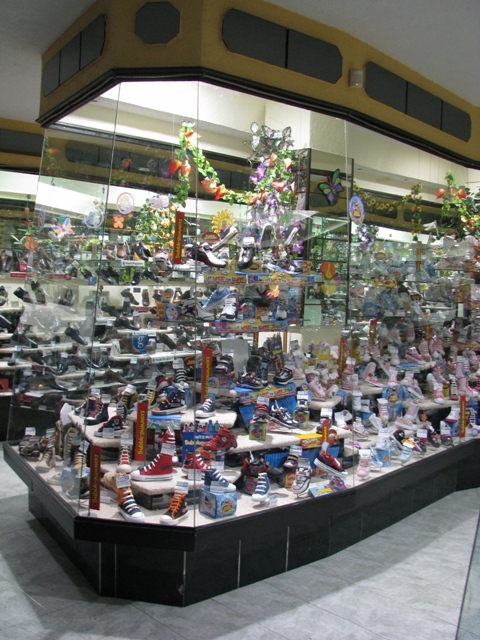 There were so many styles, sizes, colors and infinite varieties of shoes it was just mind boggling to think of which one to choose. We haven’t seen this on main street USA in many years. I remember the “Red Goose” and “Poll Parrot” shoe stores of my youth. As a young women, I would look in the window and think how cute they were and want the latest styles. Many times, they didn’t have them in my size. Here they have every size from infant to Large in the window. It is kind of fun to look ,see, and laugh at how impossible it must be to walk in some of those. The colors are also fun. Shoes for men in bright Blue, Pink, Red and whatever you have the nerve to wear. Women’s shoes that are so high that you are literally walking on your toes. I personally can’t see how the women walk on these cobblestone streets and uneven sidewalks in them, but they do and don’t seem to trip as frequently as I do in my “sensible” shoes. http://www.welleatenpath.com It was a delightful evening, and we got some nice video because we were in a private residence with nice lighting. Why don’t you take a peek into the house with me and catch a few pieces of their fine performance. And here is another look. David Rubio Glavan, an artist of Jarocho music and center is the above photo, can be contacted at — davidrubio33@hotmail.com. While visiting Xalapa for several weeks this past Spring, we had an opportunity to be entertained on two occasions by a musical group known as the “Sones de Veracruz” who appears to be lead by David Rubio Galvan (davidrubio33@hotmail.com). The group seems to have a “gig” every Friday (or Saturday?) night at La Consa Beatrice Restaurante, just a few blocks from the zocálo in Xalapa. Here are some photos of Rubio and some of his fellow musicians. I was fortunate to be with Steve and Pat on the day when Roy brought them to Coetzala. I was a slacker and didn’t take nearly as many photos as Steve, the Genuine Tourist, but here are a few. This is the same suspension bridge as the one Steve posted. I’m on the opposite side of the river from the town, where the road dead ends. This bridge is the one and only way into this community. From the village side of the river, a view of the road’s end, where all vehicular traffic gets left behind. I’m normally rather shy about taking photos of people. I’m always afraid of offending. But I enjoy Steve’s people pictures so much, hanging around him encouraged me to try to get over that a little. Even though they are isolated, the people of Coetzala do have electricity and running water in their homes. Here you can see the electric lines and a tinaco. A shed or possibly a barn, built the old fashioned way. Roy started chatting with this woman and found out she is preparing to make a salad from this spiny cactus. It is apparently a traditional salad that is eaten during Lent. I saw a number of this type of cactus plant growing in people’s yards. The tireless Genuine Tourist, hard at work, performing community outreach. The hills were alive, not so much with the sound of music but rather the braying of burros. No worries! Not dead, Perrito is snoozing on the street where there is never any traffic. In the background, the salad cactus. Everything that comes into Coetzala comes over that one suspension bridge on the back of man or beast: every sack of cement, every cinderblock, everything. I did see some road apples on the bridge, so burros apparently traverse the span as well as pedestrians and bicyclists. (For those of you who didn’t grow up with horses, “road apples” are. . . burro byproducts.) This man is cheerfully carrying a sack of cement to a construction site. The people of Coetzala were very nice and seemed curious about us. They didn’t seem to mind that we were being typical tourists and taking pictures of everything. I get a return wave from a friendly resident. Pat and I had a personal chaperone while we were walking through Coetzala. A friendly family allowed me to take their picture. It may be small, but there’s one bar/restaurant in town, right next to the suspension bridge. Scratched into the concrete on the village side at the base of the suspension cable anchor, the commemorative bridge reconstruction plaque. What is There to Do in Xalapa? 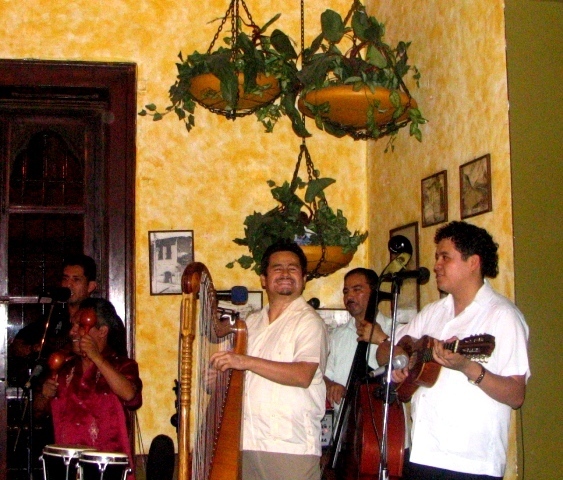 Xalapa is definitely a music and cultural scene. Right now is Junio Musical 2007 and the whole month there are dozens of concerts, many free and costing at most US$40 for something that would be much higher in the States. The jazz scene is very alive here, as well as all the other genres (classic, folklore, fandango, tango, etc.). This above video was produced by one of our members, Chris, who lives in Xalapa and writes the Ruminations of an Expatriate blog. Xalapa always seems to have something going on. This Saturday was absolutely filled with things happening (Friday was a holiday so Felipe Calderon could be made officially Presidente). There was a three-day event for the Italian-Mexicans at the Centro Recreativo (great food! ), the Encuentro de Tunas y Estudiantinas for a callejoneada with presentations at the Agora, and two fandangos with jaraneros. Plus your other night clubs, restaurants, etc. Bret Cohen lived in Xalapa from July, 2001 to December, 2002, and is in love with the city. He sometimes dreams of retiring there, as do a number of us in the group. Aside from its beautiful colonial hillside setting, the fact that Xalapa is a huge university town has led to there being an enormous amount of cultural activities and restaurants to enjoy there. Below is information Bret sent about only some of these, emphasizing his preference for workshops in theater and music. The former, of course, are more geared to those who can stay for an extended period. To start, those like you that don’t know Spanish might consider the School of Foreign Students at the Universidad Veracruzana in Xalapa. http://www.uv.mx/eee. There is also a new program, called Kiosk. More information can be found on the Meet-Up site here. Then there are the parks. Click here for pictures & links, though the text is in Spanish. Parque Juarez, right downtown, is not especially beautiful, but it has a wonderful view of a nearby volcano, the Pico de Orizaba, and the area surrounding Xalapa. Here are some photos of the Pico de Orizaba and Cofre de Perote on John Bokma’s site. It also has a building that shows international films and has a cafe with outdoor seating and a view of the volcano. There is also an extinct volcano within the city itself (on the northern edge of the city), at Parque Macuiltepec (site in Spanish). Parque de Los Berros is a lovely spot with lots of activities for children. John Bokma has more photos of it here. Paseo de Los Lagos (“Stroll Among The Lakes”) is another park, right in the middle of the university area & down the hill from center city. There is a cultural center as you walk up from the park with lots of cultural events. There is a nice YouTube video of the lake & cultural center and a few photographs here. Parque los Tecajetes is a beautiful spot recommended by John Bokma, who has a page of photos of it here. Then there is the university itself — I mean the biggest university in town, Universidad Veracruzana. There are different “faculties” (departments) spread out around the city. Above Los Lagos, going toward Juarez Park and the city center, is the Facultad de Musica y Teatro (department of theater & music). It’s a great place to meet students. There are all sorts of events either going on there or listed in the flyers on the announcement boards there. In the surrounding stores lots of other flyers are posted announcing art, music, dance and other cultural workshops. The theater department runs a community theater called Teatro La Caja (calle de la Pérgola s/n Zona Universitaria, Xalapa 814 8672). In addition to the showing of plays, they put on theater workshops for the Xalapa community. I watched one and also participated in an improvisational workshop there. There is a web listing (in Spanish) of lots of cultural activities at Caftan Rojo, which includes activites throughout Veracruz, and an online tourist guide of Xalapa activities at Xalapa Tips. There are a variety of music events and orchestras. One of my favorites is a yearly series of events in June, Festival Junio Musical Lately, they have been devoting the festival to a different country. They invite musicians from the selected country to come play. 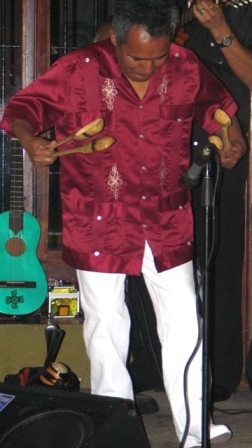 On a visit last year I saw lots of wonderful Brazilian music. In August the city of Veracruz hosts Festival Afrocaribeño – workshops, dance & music related to carribean influences. The sparkling Museo houses an amazing collection of artifacts from pre-Colombian civilizations of Veracruz. For further information, see the Museo de Antropología article on this site, recently updated. Xalapa has the largest collection of Diego Rivera paintings in Mexico at a gallery called Pinacoteca Diego Rivera near City Hall and Parque Juárez in the downtown area. This 16-acre regional botanic garden is committed to the study and conservation of native flora, especially threatened and endangered species. Located 2.5 kilometers from Xalapa and 7 kilometers from Coatepec. More information on the FJC Botanic Gardens from the Botanic Gardens Conservation International. An exchange student’s impressions on a visit to the FJC Botanic Garden. The Anthropology Museum in Xalapa gets high marks from everyone who visits. It is renowned for having seven giant Olmec heads on display. About seventeen have been excavated in the State of Veracruz. Carved from basalt, the heads range in size from 6 to 9 feet tall and are estimated at about 20 tons. The museum houses an amazing collection of art and artifacts from pre-Colombian civilizations in Veracruz. http://www.uv.mx/max. The flash intro is wonderful! Chris, one of our members who moved to Xalapa in 2006, posted a report on his trip to the museum along with some great photos, from his Ruminations of an Expatriate blog. This page, from the Xalapa Tourist Network, has some nice images and information in both English and Spanish. Beautiful photos, both interior and exterior, can be found on George and Audrey DeLange’s pages. They are an American couple who have traveled extensively, not only throughout Mexico but all over the world. Their photographs are enough to make you start planning your trip to Mexico today! More photos of the Olmec Heads at the museum from the Latin American Studies organization. A beautiful image of the museum’s entrance hall is here. Photo by Edward Dawson of Dallas, Texas. A couple more nice photos here on a blog entry from Mexico-with-Heart. From Planetware, an article on the museum here.